Auction activity across the combined capital cities will be slightly subdued this week, with 1,588 auctions currently being tracked by CoreLogic, down from last week’s final result of 2,001 auctions held. However, activity is expected to be higher than what was seen over the corresponding week last year (1,399). Looking at each of the individual capital cities, activity is varied week-on-week with Sydney expected to see the most significant fall in volumes over the week, down 29 per cent, while in Canberra volumes are expect to rise by 67 per cent. Sydney is scheduled to host 600 auctions this week, down from 724 last week, while in Melbourne 728 properties are set to go under the hammer, decreasing from the 801 auctions held last week. Brisbane, Adelaide and Perth will also see a fall in volumes over the week, with Canberra being the only capital city where volumes will rise, while in Tasmania auction activity will remain steady. The busiest suburbs for auction this week are all in Victoria, with 16 properties scheduled to go to auction in Reservoir, followed closely by St Albans and Mill Park with 14 and 13 auctions respectively, and Craigieburn and Glen Waverley both host to 12 auctions. The final auction clearance rate across the combined capital cities increased week-on-week, however still below the 70 per cent mark for the 5th consecutive week. 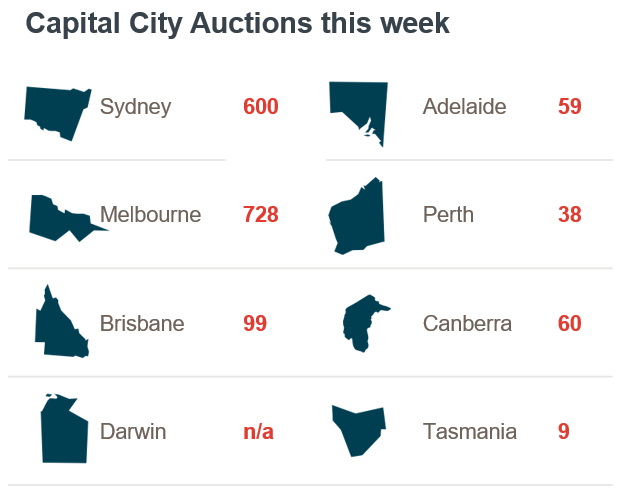 There were 2,001 capital city auctions last week, with 67.3 per cent of the 1,768 results reporting as successful, increasing from the previous week’s 66.5 per cent across a higher volume of auctions (2,355). In Sydney, the final auction clearance rate recorded 68.0 per cent of the 840 auctions as successful last week, the 4th consecutive week’s where the clearance rate has been below 70 per cent, lower than the week prior when the final clearance rate for the city was 68.2 per cent across 939 auctions. Across Melbourne, the final clearance rate increased only slightly last week, recording a 70.8 per cent rate of clearance, compared to 70.7 per cent over the week prior. However there were a lower volume of auctions last week, with 874 properties taken to auction, down from 1,047 the previous week. Across the smaller capital cities, clearance rates improved in Brisbane, Canberra, Perth and Tasmania, while Adelaide’s clearance rate fell week-on-week. Of the non-capital city regions, the Geelong region was best performing in terms of clearance rate, with 77.1 per cent of homes selling. While the Gold Coast had the highest number of auctions (55).